If you find that no matter how much you vacuum your rugs or wall to wall carpets, it still does not look like it once did, or if you have those stubborn stains that just don't come out, it may be time for a Professional Carpet Washing. While there are many cleaning methods out on the marketing today to try to do it yourself, hiring a professional carpet washing is the most reliable, safest and quickest options. There is nothing more difficult than choosing the right carpet washing professional when you're in a rush. There are many different companies using many different methods. With so many options how do you make the right choice? The Atlantic1 exclusive Hot Water Extraction Method, using truck mounted equipment and powerful cleaning agents make it the most effective and thorough washing method in the industry. Atlantic1's exclusive process begins with an all natural, hypo-allergenic pre-spray being applied to the carpet that begins to emulsify and break up the dirt and soils. Then, the 200 degree water and powerful suction extract deep down dirt, cleaning solution, and 95% of moisture for a fast drying time. It also removes dust mites, allergens, and other microscopic pollutants that collect in your carpet and can trigger allergies and other breathing problems. Atlantic1's deep washing process is highly effective on everyday dirt and soil buildup but no matter how careful you are you are bound to have some stubborn stains. 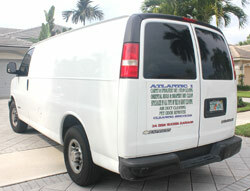 Atlantic1 offers a wide variety of stain removers to eliminate most spots. We offer a filtration soil remover to remove dark lines along walls and behind doors, a stain remover that can eliminate or improve red wine and juice spills. We also have spotting agents to remove ink, gum, rust, grease, and many more spots. If stain removal is not possible we can provide you with an estimate to do a bonded insert or "patch" on the stained area.